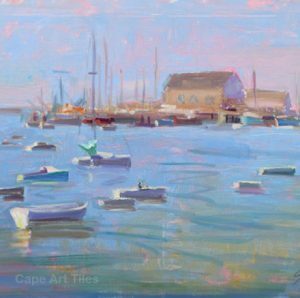 Cape Art Tiles represents local/regional artists from Cape Cod, MA, whose works can be found in galleries, museums and collections throughout the country. We reproduce their images on various substrates including ceramic tile, marble and sandstone coasters, glass cutting boards and key/coat hangers. At Cape Art Tiles, we have a commitment to quality reproduction as well as using American made supplies where ever possible.